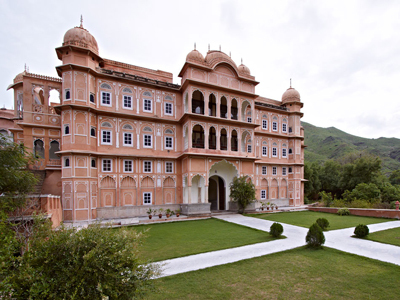 Pick up from your Hotel /Home in Delhi and transfer to Patan Mahal which is 175 KM on Delhi Jaipur Highway. Upon arrival at Mahal. Welcome drink and check in to hotel . Rest at your own. PM enjoy The patan Mahal facilities . Dnner at Hotel. Overnight at Hotel. The historical city of Patan is about 70 miles northeast of Jaipur,on the Kotputli Sikar road, off the National Highway 8, the road which connects Jaipur and Delhi. Nestled in a valley formed by 3 hills, Patan Mahal rises in the distance at the end of the city. The palace is well-located with an unhindered birds-eye view of the 13th century ancestral fort and another palace called Badal Mahal which stands loftily at an imposing 2000 ft above sea level. Patan is a city in the Indian state of Rajasthan. In the 12th century, it became the centre of a minor state called Tanwarawati or Torawati (after Tanwar/Tomar the clan name) ruled by the Tomara clan. The chief of the clan is the Rao of Patan, and he is considered to be the direct in descent from the last Hindu Emperor Anang Pal Tomar II the ruler of Delhi before Prithviraj Chauhan. Situated 175 kms from Delhi and 125 kms from Jaipur ,Patan Mahal is a Heritage Home, surrounded by it’s own farm on one side, an 800-year-old fort and another palace halfway up a hill. The beautifully appointed rooms at Patan Mahal reflect the royal heritage of Rajputana, and the Patan Family.All our rooms have clean and well designed bathrooms, with hot and cold running water and bathtubs. After breakfast at Hotel. Enjoy Patan Mahal and time at your own. On time transfer back to your hotel / Home.